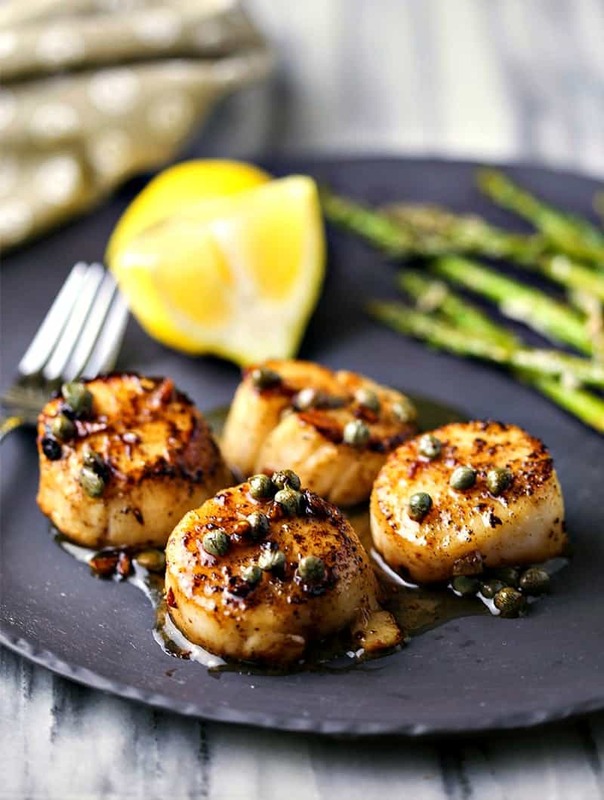 You’ll be amazed at how easy it is to prepare an elegant and delicious seafood entrée at home! 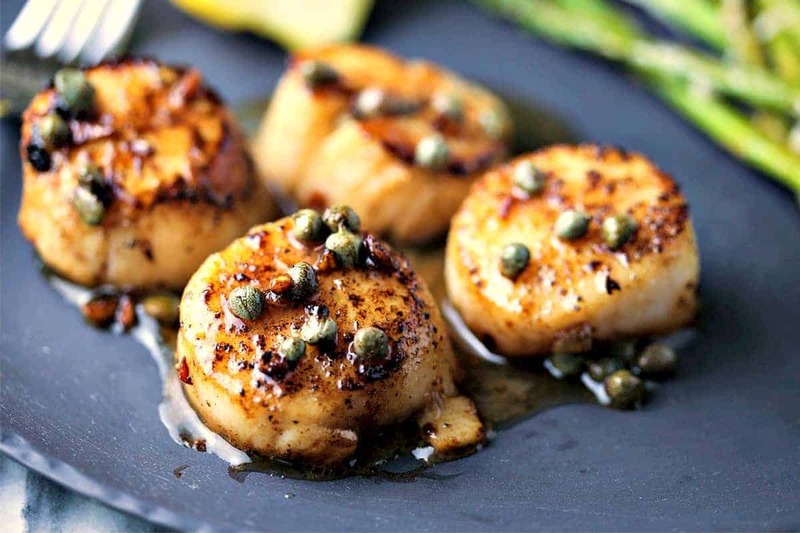 Brown Butter Scallops—sea scallops pan-seared in butter—get their finishing touch from a flavorful brown butter sauce enhanced with garlic, capers, and fresh-squeezed lemon juice for a truly gourmet dinner! Every beach vacation, I look forward to dining out at seafood restaurants where “the catch of the day” literally means fresh fish, shrimp, scallops, and oysters have been hauled in by local fisherman and delivered to the chef for their evening creations, straight from the net to the chef’s grill. I’m a fan of lots of fish, but fresh sea scallops are one of my favorite beach dinners because of their mild, slightly sweet flavor and firm, yet buttery, texture. 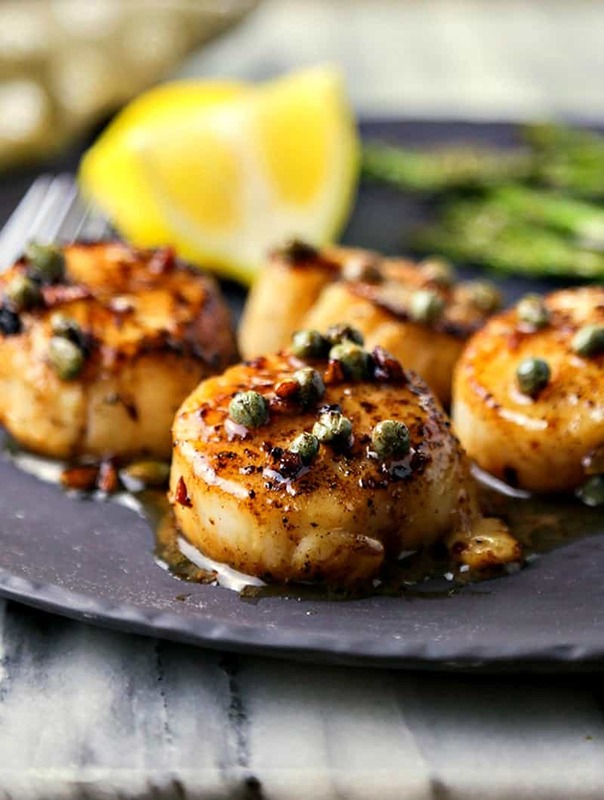 Often, scallops are seared and paired with a lemon, butter, or white wine sauce, all of which work well with this delicate fish. I would never have attempted to cook scallops at home for fear that they just wouldn’t be as satisfying as the fresh ones at the beach, but I recently spotted some large, beautiful scallops at our local seafood counter. 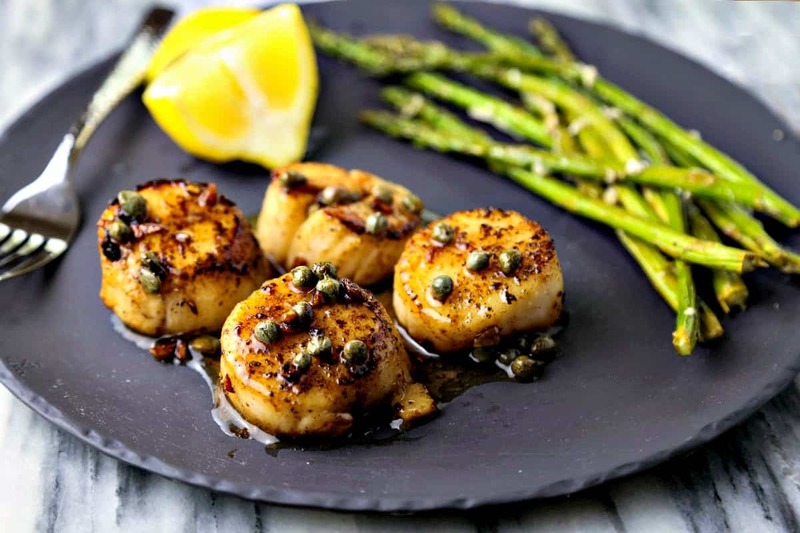 The butcher informed me that for our area the best scallops can be bought when they are in full season, which is May through August on the East Coast. Taking a chance, I came home with a pound and prepared these Brown Butter Scallops. They were phenomenal! 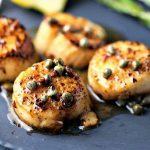 Scallops don’t require a lot of cooking time, so this entree is ready in less than 15 minutes, start to finish. Seared in butter over high heat, the scallops get a nice little crust while the inside remains a tender, buttery texture. Serve alongside this Lemon Parmesan Roasted Asparagus by Damn Delicious (another delicious recipe ready in less than 15 minutes) or with a simple buttered angel hair pasta. Enjoy! Line a plate with paper towel. Place scallops on the plate and gently pat dry on all sides. Sprinkle evenly with the salt and freshly ground black pepper. In a large non-stick skillet, melt 1 tablespoon butter over high heat. Add scallops to the skillet and sear 2 minutes on each side. Remove scallops from the skillet and keep warm. Reduce heat to medium high and add 3 tablespoons butter to the skillet with the garlic. Cook for 1-2 minutes or until the butter turns golden brown, being careful not to burn the garlic. Turn off the heat and stir in the lemon juice and capers. Spoon sauce over the scallops and serve with angel hair pasta, if desired.